Registration Form – Please complete the online form below or download this form. This form is required to enroll your children in the RE program. Each family must complete this form once a year, preferably at the beginning of the RE year (September). If you need to complete the form, please complete it and email to alison@uufsd.org or bring it to R.E. class on Sunday. Field Trip Form – This form is required for any off-site field trip. Please complete the form and return it to the adult who is organizing the event. RE Curriculum 2017-2018 – A handy reference for general information on the 2017-2018 RE program. 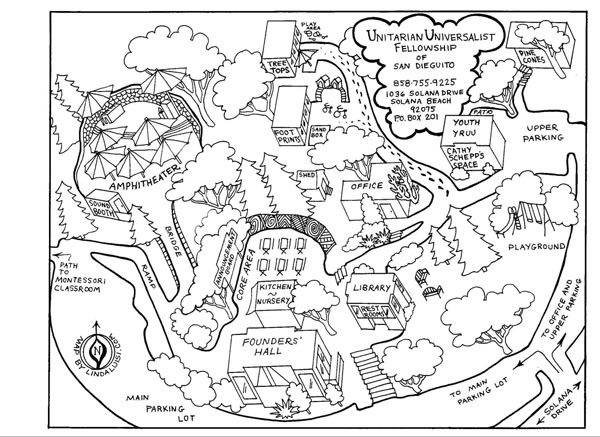 UUFSD Site Map – A handy map of our facilities to help you find your way around. Safe Congregation Policy – Guidelines for a variety of events and situations to ensure the physical and emotional safety of all members of the UUFSD community. – Just click on the “Donate” button and pay your contribution online. The Razoo website provides a tax receipt, as your donation may be tax deductible.